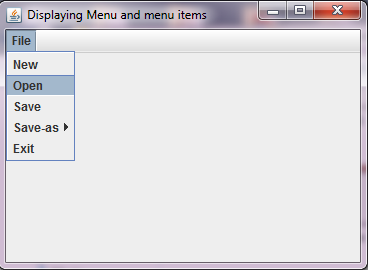 In this article, we are going to understand how to add a menu bar, menu and its menu items to the window application. A menu bar can be created using JMenuBar class. 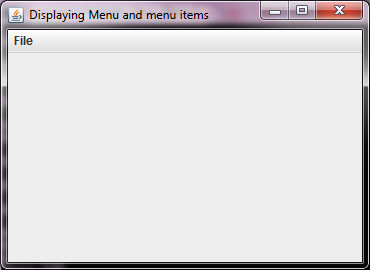 A menu bar may contain one or multiple menus, and these menus are created using JMenu class. 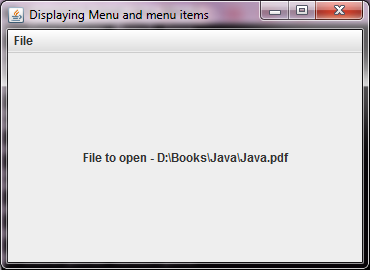 A menu may contain one of multiple menu items which are created using JMenuItem class. public JMenuBar() Creates a menu bar to which one or many menus are added. public JMenu(String title) Creates a menu with a title. public JMenuItem(String title) Creates a menu item with a title. Creating a menu, menu items and a submenu. 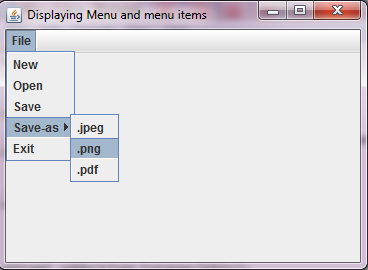 When you click on this menu named File, you are presented its menu items such as New, Open, Save and its sub-menu Save-as and its menu items such as .jpeg, .pdf, .png. Handling click events on menu items using ActionListener. When you run the code, you are presented a window that shows the same menu as we have seen on executing the previous program. 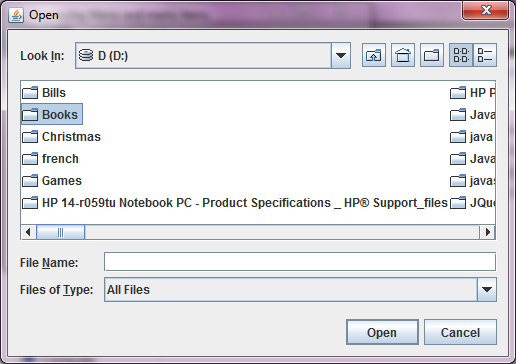 When you click on the menu item named Open, a file chooser dialog window opens us, using which you can choose any file in your computer that you wish to open. When you select this file, you are presented its path. In the another response to menu items being clicked, when you click the Exit menu item of our program, the program exits and gets closed.